An added advantage of having children, who choose to work and live overseas (although sometimes there’s no choice if you’re an electro-chemist working in renewable energy) is that there’s always free accommodation when we travel to visit them. For this reason, we’ve been able to afford trips to Europe as well as New Zealand and, now, Singapore. In fact, we’re currently staying with number 1 chronological son (number 2 chronological son, being the analyst-programmer as well as my personal tech support, advised against using family names or photos in blogs) and enjoying all that Singapore has to offer and, like most Singaporeans, we’re doing it all on driverless trains. In Singapore, owning and driving a car requires a COE (certificate of entitlement) which generally costs more than the car. It’s a good way to limit the number and quality of cars on the road because, let’s face it, no one wants to pay thousands of dollars for a COE to drive a lemon. Singapore is quite regimented, with fines for everything from sipping water or taking Durians (stinky fruit that smells like vomit) on the train to dropping lolly wrappers in the street. In fact, there’s a local joke that Singapore is a ‘fine’ city. But you can walk the streets safely at any time of night and it’s definitely very clean. Apart from the airport guards, the locals are friendly and, on the surface at least, everyone seems to get on with everyone else. So far we’ve checked out Raffles (home of Singapore Slings), China Town, Sentosa Island, Little India, the riverside bars as well as the Gardens by the Bay (the super trees are spectacular at night), sampled lots of local fare plus we’ve become quite adept at using the rail system on our own while ‘the children’ are at work. There’s also a pool at the Condo and we seem to be the only ones using it. Obviously the locals are quite accustomed to the humidity. We’ve also spent an incredible weekend in Indonesia on Batam Island, which is just a ferry trip away – thanks to a very generous son, who paid for the accommodation as a birthday present for Nigel. So, overall, we’ve been well and truly spoilt. Tomorrow morning, after 12 days’ holiday, we fly back to the outback with its welcoming dry and dusty heat. Who knew we’d miss it?? After five weeks’ holiday we’re home from Singapore and the coast and while Nigel has settled into all things ‘law and order’, I’ve been sifting through the mountain of paperwork and receipts that I’ve saved for our tax returns. Meanwhile, the Bear is playing “Who’s the Boss?” with Harley and Whipper so it’s fairly safe to say that life has returned to normal. However, while we were away, something happened that was so inspiring I had to share it with you. While Bourke has been struggling with severe drought, other farming areas have enjoyed quite a good season and in a spirit of true mateship, Western Australian Sam Starcevich (Farmers Across Borders) and Riverina based electrician Brendan Farrell (Burrumbuttock Hay Runners) decided to do something to help. What followed was perhaps the biggest hay donation in Australia’s history and on Friday the 4th of April, 2014, 52 trucks and 78 trailers rolled into Bourke where the hay was delivered to North Bourke packing yards, to be distributed to graziers in the Bourke region. The convoy carried 920 bales of hay and stretched nearly 5 kilometres. The Burrumbuttock Hay Runners call themselves “just a bunch of blokes trying to help out a fellow Aussie in times of hardship”. I reckon that pretty much sums up the true Aussie spirit! PS Fast forward two years later to March 2016 and I had to include this link. This video was so inspiring it made me cry. What a great country we live in! As a ‘special remote’ location, there are quite a few differences between Enngonia police station and its city cousins. For a start, there’s no Sergeant and the boys run the station themselves. Also, they have their own diesel pump, often wear Police overalls (I call them romper suits) and write up their own rosters. They drive troopies rather than an “icecream truck”, sedan or Johnny Cab (Think Total Recall) and generally, do pro-active rather than reactive policing. When things like printers and modems break down they fix them themselves because help is just too far away. Author KayePosted on July 15, 2006 December 15, 2016 Categories Enngonia 2014Tags Eaglenet, Police overalls2 Comments on The eagle has landed! 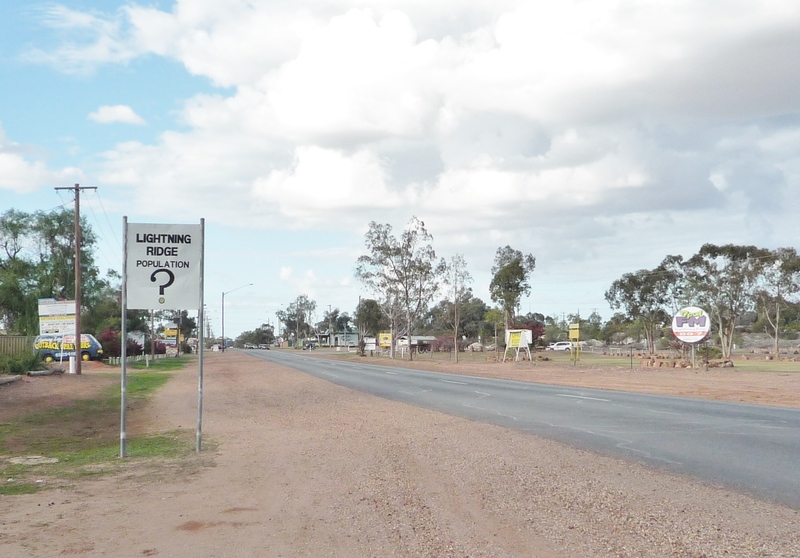 Last week we spent my birthday at a caravan park in Lightning Ridge – some 400 kilometres ‘up the road’. Of course, it wasn’t quite the same as Batam Island where we spent Nigel’s birthday but surely ran a close second! This is not your usual outback town and driving around, you might be forgiven for thinking you’d entered some kind of parallel universe. No one knows for sure what the population of the Ridge is – which seems to have something to do with the fact that there are quite a few residents hiding out from ex-wives and/or the law etc. A large percentage of residents are miners – in search of the elusive black opal, for which the town is famous. According to the odds, it’s a massive gamble because one in ten miners will actually find opals and of that group, one in ten will make any money out it and in that group (you guessed it!) one in ten will get rich from it. However, if you talk to a miner you’ll discover that they love it and will willingly spend a great deal of time, energy and resources down a mine shaft listening for the sharp tap when the pick hits opal. This happy addiction is fed by the knowledge that a good black opal (with a degree of red through it) can fetch around $10,000 per carat! For anyone interested, you can purchase an annual mining licence, that will entitle you to stake a claim 50metres by 50metres. Here’s the ‘dirt’: Opals are found under a layer of sandstone, which contains voids left by decayed vegetation, fossils etc. When water seeps through these cavities, it leaches the silica from the sandstone and deposits it further down under the sandstone where it builds up (think millions of years). As the water continues on its way, it leaves behind the silicone deposits which, under pressure (think more millions of years) crystalise and become opals. The first thing you’ll notice as you approach Lightning Ridge is Stanley, the 18 metre metal emu built by local artist John Murray. His body is actually made up of two car bodies and his eyes are satellite dishes so you really can’t miss him. The next thing you’ll notice is that there are seemingly no building regulations regarding the ‘homes’ which have been erected on the claim sites dotted throughout the opal fields. The Ridge has quite a lot to offer tourists including art galleries, fossicking heaps and opal mines open to the public. We were lucky to be allowed to take the Bear down one of the mines – although, to be honest he didn’t try very hard to hide his discomfort and was obviously relieved when we were back above ground. There’s also a sidewalk restaurant that sells Italian fare, a pub, Bowling Club, Aquatic Centre (we were jealous) plus a huge community artesian spa pool (we were very jealous). Then there’s the weird and wacky Amigo’s Castle, Bottle House and Astronomer’s Monument as well as (apparently) the largest collection of succulents in the Southern Hemisphere. The people might be eccentric (car doors strung from trees advertise anything from self-guided tours to the ‘Nudies Camp’) but they’re friendly and welcoming and with perfect winter weather we had a lot of fun. In fact, the only place we were sorry to miss was the Chambers of the Black Hand http://www.chambersoftheblackhand.com.au/ (underground mine and tourist attraction) with its many carvings and sculptures but unfortunately no Bears were allowed. We finished the holiday with a visit to John Murray’s Art Gallery with the intention of passing on regards from Anne and exited with a stunning print (my birthday present) titled Where the Wild Dogs Roam. It so reminds me of outback skies that I fell in love with it as soon as I saw it. If you’re interested, you should find it here. Well, I’m back at Number one son’s computer in Singapore but at least this time the keyboard is set to English (last time it was German) and I can now find the apostrophe. Firstly apologies for the huge email that I sent from Lightning Ridge and apparently forgot to resize the photos….. it didn’t even fit in some of your mail boxes so huge humble apologies that! Callum and I have had a bit of a whirlwind trip and between us we’ve managed to fit in quite a lot of tourist attractions including Singapore’s famous Botanic Gardens. Other sight-seeing included the Dinosaur Exhibition, Little India, Singapore Zoo, Sentosa Aquarium, China Town, Gardens by the Bay and even the Light Show, which Nigel and I missed last time. We did it all by public transport and I’m proud to say that we never once got lost…… although I must admit that my grandson has a much better idea when it comes to all things directional! There were also the mandatory swims in the pool every afternoon – usually after shopping – as well as a chance encounter with a rather large water dragon that luckily decided that it didn’t want to cross our path after all! Now, there’s just one more sleep before we head off to the airport tomorrow night. It’s been fun catching up (and being spoilt) but now I’m looking forward to some winter weather again. After years in the outback, this humidity has become quite foreign to me, if you’ll excuse the pun. Being one of those people, whose worst nightmare would be to wake up and discover I had nothing to do, the first half of 2014 proved to be quite fulfilling, with a town project to keep me busy and ‘off the (half a dozen) streets’. I was asked to write an application, on behalf of the Enngonia War Memorial Hall Committee, for funding, under the Anzac Centenary Government Grants Programme, to construct a cenotaph area outside the Memorial Hall. The submission was to fund a fenced concrete slab, remembrance wall and plaque and flagpole, as well as display cabinets and an honour board in the Hall foyer.